Gesture of empathy: ACU Vice-Chancellor Professor Greg Craven, Brisbane Archbishop Mark Coleridge, Fr Anthony Casamento and Associate Vice-Chancellor Professor Jim Nyland don sunglasses in a gesture of empathy and respect for St John Paul II. HE was the shepherd of the Church for 26 years, now St John Paul II is watching over the students at Australian Catholic University, Banyo. Brisbane Archbishop Mark Coleridge blessed a new statue of the former pontiff on November 11. ACU Vice-Chancellor Professor Greg Craven said the statue was a valuable addition to the award-winning John Paul II Building on the campus. 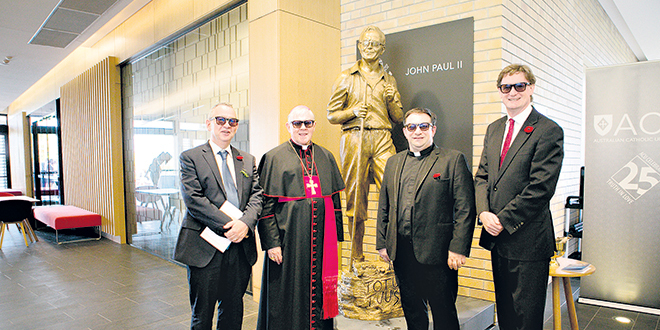 “We named the building in honour of the great thinker and philosopher St John Paul II, and this statue will serve as a reminder to all who see it of ACU Brisbane’s commitment to creating cognitive and critical thinkers,” Professor Craven said. He said St John Paul II was renowned for his love for young people. “… How he would challenge them intellectually, and preach the Gospel with courage and we seek to instil those values of intellectual rigour and moral courage in all our staff, students and graduates,” Professor Craven said. He said staff, students and guests wore sunglasses in a gesture of empathy and respect for the late pope who is wearing sunglasses in his statue. Pope John Paul II’s motto was Totus Tuus, a Latin phrase meaning “totally yours” and expressing his personal consecration to Our Lady based on the spiritual approach of St Louis de Montfort and the Mariology in his works.